Stroud Morris Men were formed in 1978, and were joined rapidly by Stroud Morris Ladies to make up two sides. 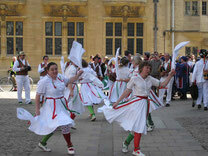 Gradually, the Morris Men have left, and Stroud Morris Ladies have persisted, so we are now a ladies' side. We have always been very interested in keeping a high quality of dance, but we are able to do this whilst enjoying ourselves - and hopefully giving enjoyment to our audiences at the same time! Stroud Ladies were the first women's Cotswold side to be invited to dance in the arena at the prestigious Sidmouth International Folk Festival. Over the last 10 years we have been invited back several times, once as part of the Morris On show. Our latest Sidmouth honour was to be invited there as a "display" side in 2013. Take a look at the slideshow on our homepage to see photos. We've had the honour of performing in several Morris On shows, featuring music and dances from the album Grandson of Morris On which we were selected by Ashley Hutchings to perform. If you'd like to find out more about the side, speak to a member when we're out & about, or click here to contact us.